So that you do not miss any of the important changes, let me summarize them first. The changes affects everyone, so take time and get ready for all the good stuff coming your way. IV. Bundle Maker - Fun it is now! Two more Pro Themes will be available by Aug end. Real time live chat is now available and will be replacing the old inbox syste. Unified chat sports completely reworked private messaging feature which every user on your website will love. Migrate from other Joomla social extensions to JomSocial. Currently supports Community Builder and EasySocial. Migration support for commercial Community Builder addons is coming soon. This is for good, everyone gets to benefit from these changes and gets enhanced acccess. Standard plan sadly had to go back to its original features as we found it very difficult to empower the Pro and SuperCharged users. These pricing changes take immediate effect. First of all Standard plan ($99) does not have renewal discount and Pro Plan renewals is at $99, so standard users are only gaining with this upgrade not to mention the benefits Pro plan offers. Standard Plan is supposed to be basic plan and it should remain so. SuperCharged Plan is for serious developers and 6 months duration is pretty short. We agreed with the feedback from supercharged users and are glad to double the duration to 1 year. From now on SuperCharged can be renewed with 30% discount (rounded off to $200). Renewal option was not available earlier. Pro and SuperCharged users can now request for free installation or migration support from our experts for free. Apart from 35+ modules / plugins included in the JomSocial, the team over a period has developed 16+ Premium Modules/ Plugins. These are available to be purchased as bundle or single addon’s with price range of $14-$19 with total worth $255. These addon’s are now available for Free to Pro and SuperCharged users. JA Mood is the latest Social template from JoomlArt and is free for Pro and SuperCharged users. 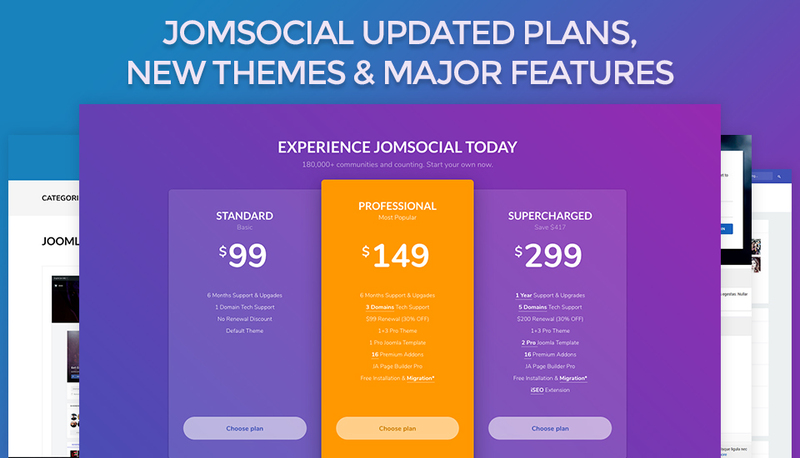 JA Social II Joomla Template is soon coming to Pro and SuperCharged Plan. 1. New simplified Pricing Page and detailed comparison chart. Just check it out here, we really simplified it. We are loving all the attention and support from JoomlArt from the very day we merged together. We now will have a total of 4 brand new themes (2 released already) by this month end and 2 Joomla Social Templates for Pro and SuperCharged users. All these templates and themes will be showcased under Templates & Themes section (Work in progress). Expect more designs from JoomlArt. Download section is now much simpler, faster and user friendly. Expect more refinements to this section. Work in progress, expect simplified license manager in the upcoming days. Give it a try, we are sure you are gonna love the Bundle Maker. Bundle Maker is fun, go and try it yourself. Make your own product bundles and get incremental discounts. That's it, thanks for reading our long blog post with huge updates and changes. Let us know your comments by putting your ideas in the comment box below. JomSocial On Joomla 4. What to expect? Poll: Which Gavick JomSocial Template you like the most? Vote & Win Pro memberships at Gavick & JomSocial. Weekend Update: New JomSocial Theme Preview. Name It And Get Free JomSocial Professional! Weekend Update: Developer Preview 3 With JomSocial’s Chat Feature Shaping Up And You Can Try It Today! 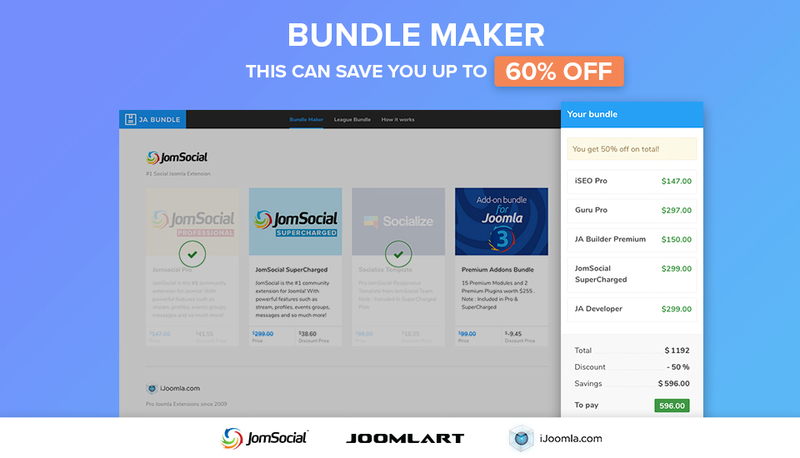 Celebrate 4th Of July With JomSocial; Store-wide Discounts For New Purchases Of JomSocial Professional, JomSocial Supercharged And Socialize Template. Weekend Update: JomSocial 4.4 Development Preview 2 With Chat System Enabled Has Dropped And It’s Awesome. Summer Holidays: Three Weeks Of Sales And Discounts For Selected JomSocial Packages!